Probiotics are a popular topic in nutrition but now they are making their way into skincare too. According to The Every Girl, “skin has its own beneficial microbiome; it helps maintain skin’s health, clarity, resilience, and suppleness. The good bacteria in skin’s microbiome also battles beauty busting bacteria by producing their own anti-microbial peptides.” Probiotics are products that contain live microbes like bacteria and yeast and are helpful in creating a well-balanced ecosystem in the body (inside and out). They are all about restoring balance, have an anti-inflammatory effect, and they can also be useful for exfoliating. 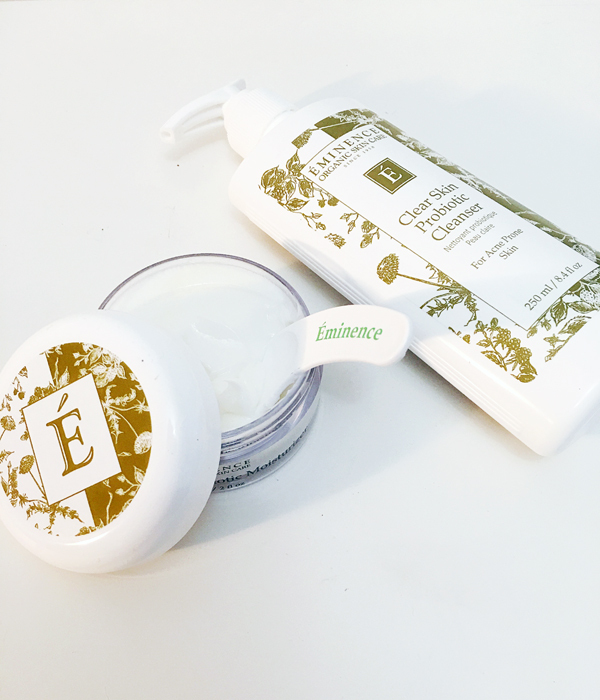 I put these probiotic claims to the test with Eminence Organics Clear Skin Probiotic Cleanser and Clear Skin Probiotic Moisturizer. Both are ultra-light and detoxify the appearance of my problem skin, helping prevent the appearance of blemishes and reducing inflammation. I was surprised when I saw immediately results after only one week and from now on, I will be incorporating probiotics into some aspect of my daily skincare routine, whether in my cleaner, moisturizer or a serum.